One Piece (1): JDM Style Sun/Moon Roof Visor Wind Deflector. 35 in (880 mm). DARK SMOKE COLOR. Color: Smoke Black. If the item is defective, we will replace the item after we receive the defective item back for our protection. This page is for one piece of high gloss solid black roof overlay sheet with paper backing. The standard size of the roof overlay sheet is 53" x 60" (135cm x 150cm), it will give your vehicle a great new look. This page is for one piece of high gloss transparent black roof overlay sheet. The standard size of the roof overlay sheet is 48" x 60" (120cm x 150cm), it will give your vehicle a great new look. Universal Self-Adhesive High Gloss Transparent Black Roof Overlay Vinyl Sheet. Removed from: 2004 VW Phaeton. Compatible with: Phaeton 04-06. Location on vehicle: Sunroof. Relays Volkswagen / Audi. Air Cooled. Audi Other. Audi TT 00-06 MK1. Audi A8 97-03. 2 PCS Set . New AERO-Dynamic Design / Plastic Coverage Design . Call or Text us between the Office Hours. The Past & The Future, Inc.
38 in (980 mm). 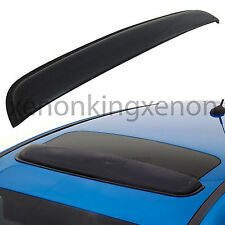 One Piece (1): JDM Style Sun/Moon Roof Visor Wind Deflector. DARK SMOKE COLOR. Color: Smoke Black. If the item is defective, we will replace the item after we receive the defective item back for our protection. BMW E30 Sun Roof Cable Covers in good working order as pictured. 2014 - 2015 Kia Forte (4 Door Sedan & 5 Door Hatchback). Sunroof Deflectors create an airstream up and away from your sunroof, directing bugs & wind up and over the vehicle! Official Kia Accessory! 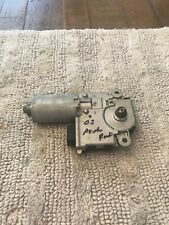 Genuine Kia Part # A7023 ADU00. We are always willing to work out any problems. Warranty on electronic devices is void if identifying mark is removed or has sign of tampering. UP FOR SALE IS A 2008 BMW E60 550I SUNROOF GLASS OEM. We are always willing to work out any problems. Warranty on electronic devices is void if identifying mark is removed or has sign of tampering. Color : MOONSTONE, MOON STONE, 21U ! 1998-2004 CADILLAC SEVILLE. A USED MIRROR.REMOVED FROM A1998 SEVILLE. GLASS IS IN GOOD CONDITIONS. AS SEEN IN PHOTOS. PASSENGER RIGHT POWER DOOR MIRROR. OUTER Door Mirror. Model: M35. Make: Infiniti. Part Type: Sun Roof. Year: 2007. We start by removing every part from the vehicle when it arrives at our facility. See the FAQ page for full warranty details. Parts Beast ID: 309780. High Quality / High Performance . Call or Text us between the Office Hours. The Past & The Future, Inc. Manufacturer Part Number: 4B0 877 071. Audi A6 S6 RS6 98-04 C5. Audi A4 S4 RS4 05-08 B7. Audi A4 S4 02-05 B6. Audi A4 S4 96-01 B5. Audi A8 97-03. 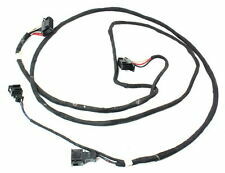 Compatible with: Audi A6 98, 8th digit VIN B. Removed from: 2002 Audi A6. It works properly and it's in nice condition. Model: Prelude. Part Type: Sun Roof. Make: Honda. Foreign Salvage provides quality recycled auto parts at affordable prices. Parts Beast ID: 310741. OEM Part Number Production Date: 7/2000. Interior Type: Cloth. · Any sign of tampering or attempt to disassemble the part will void the warranty. · Do not buy electronic parts for testing purposes. BMW E30 Sun Roof Slider Bar in good working order as pictured. E46 M3 Coupe, USA. E46 323Ci Coupe, USA. E46 325Ci Coupe, USA. E46 328Ci Coupe, USA. E46 330Ci Coupe, USA. E30 1983 - 1991 316i, 318i/s, 320i, 323i, 324td, 325e, 325i/ix/is, M3. E46 1999 - 2005 323 328 325 330. Material High Quality ABS Plastic. Manufacturer Part Number: 4B0 877 071 E. Audi A6 S6 RS6 98-04 C5. Audi RS6 03-04. Removed from: 2004 Audi A6. Audi S6 02-03. 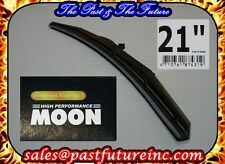 Compatible with: Audi A6 00-04. Audi A4 S4 RS4 05-08 B7. Audi A4 S4 02-05 B6. Passat 06-10 B6. Audi A4 S4 02-05 B6. Passat 98-05 B5/5.5. Passat 90-97 B3 & B4. Removed from: 2006 VW Passat Sedan. May fit: Passat Sedan 06-10 (except CC). Audi A4 S4 RS4 05-08 B7. Corrado 90-94. Up for sale is an OEM 11-15 Honda Odyssey Sunroof Assembly. Sunroof is in good used working condition as shown in pictures. Glass free of scratches. Donor Vehicle: 2014 Honda Odyssey EXL with 41 k miles. OEM Sunroof Assembly. Make sure to inspect the item THOROUGHLY using the information and pictures above before buying. 2015-2018 Escalade, ESV. MAY ALSO FIT OTHER YEARS, MAKES AND MODELS. 2004 Lexus ES 330 Sedan. UrParts 2019. Passenger side: Right side RH. D rivers side: Left side LH. OUR PROMISE. SPEC & FEATURES Product: Roof Vent Window Visor Qty of Set: 3pc Type/Style: Tape-On Color: Dark Smoke Surface Finish: Acrylic Video Installation Code: LT Sport GvEAVOsWGTo Caution: According to some countries may have different roof size, please measure your "Moon/Sun Roof" and compare with the dimension of our visor. Manufacturer Part Number: 4B5 877 041 D. Audi A6 S6 RS6 98-04 C5. Removed from: 2000 Audi A6. Notes: Take a close look at the pictures and make sure this sunroof matches yours exactly. Audi A4 S4 RS4 05-08 B7. This page is for one piece of 3D texture carbon fiber vinyl overlay sheet. The standard size of the vinyl overlay sheet is 50in x 60in (127cm x 150cm), it will give your vehicle a great new look. 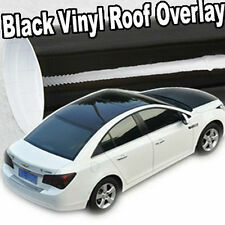 Universal Self-Adhesive 3D Texture Carbon Fiber Roof / Hood / Trunk Overlay Vinyl Sheet - Black Color.